We are thrilled to host two fantastic poets from Denton this month! 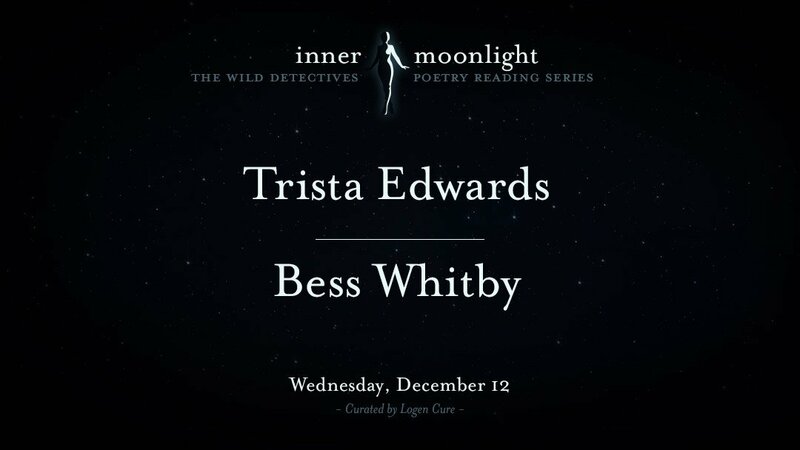 Inner Moonlight will feature Trista Edwards and Bess Whitby. Short open mic to follow, so come prepared to be brave. Trista Edwards is an associate editor at Luna Luna Magazine. She is also the curator and editor of the anthology, Till The Tide: An Anthology of Mermaid Poetry (Sundress Publications, 2015). You can read her poems at 32 Poems, Quail Bell Magazine, Moonchild Magazine, The Adroit Journal, The Boiler, Queen Mob’s Tea House, Bad Pony, Occulum, and more. She creates magical candles at her company, Marvel + Moon. Bess Whitby is a writer and cellist living in Denton. She holds an MA in creative writing from the University of North Texas, where she currently works as marketing manager for UNT Press. Bess is an active participant and behind-the-scenes organizer with Spiderweb Salon, the Denton-based arts collective, and her work appears in dozens of the Salon’s zines. She lives in a cozy duplex with her partner, two cats, and a dog. Don’t forget Inner Moonlight is every second Wednesday of the month! We can’t wait to see you there.